Prepare for an evening of incredibly provocative, eclectic art and performance on as Three Rooms Press presents ¡LA DI DADA! a wild ride of contemporary DaDa performance and poetry by leading maverick artists. The event includes the West Coast launch of the internationally-renowned MAINTENANT 9: Journal of Contemporary DaDa Writing and Art (2015, Three Rooms Press), which features more than 150 visual and literary works by artists and writers worldwide and for the first time MAINTENANT is in Full Color Throughout!!! 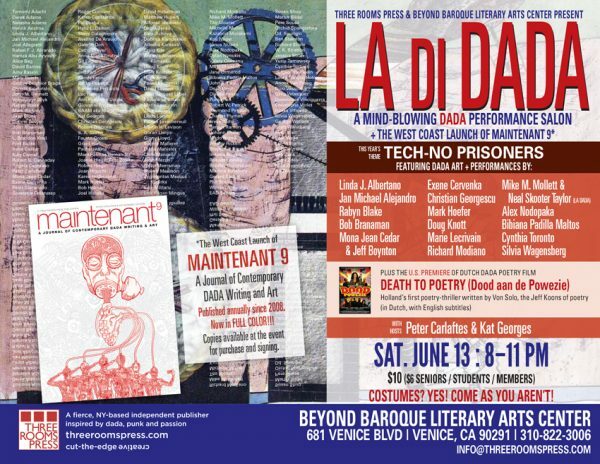 The event takes place Saturday, June 13, 8-11 pm at Beyond Baroque Literary Arts Center in Venice. Costumes encouraged. Featured performers include Beyond Baroque director and poet Richard Modiano, artist Bob Branaman, artist-poet-musician Exene Cervenka (X, The Knitters), famed playwright-poet Doug Knott (Last of the Knotts), performance poet extraordinaire Linda J. Albertano, LA Dada Maestros Mike M. Mollett and Neal Skooter Taylor, poet Marie Lecrivain, Fluxus artist Bibiana Padilla Maltos, poet-performer Christian Georgescu, poet-musician-playwright Jan Michael Alejandro, Circuitry & Poetry with Mona Jean Cedar & Jeff Boynton, Dada artists Rabyn Blake, Silvia Wagensberg, and Alex Nodopaka, plus special guest performer Cynthia Toronto. Three Rooms Press co-directors and New York-based performance artists Peter Carlaftes and Kat Georges will host. Maintenant 9: A Journal of Contemporary DaDa Writing and Art (Three Rooms Press, 2015) is the most recent installment of an annual series published since 2005. The current issue features work by Charles Plymell, Mike Watt, Grant Hart, A.D. Winans, Mark Kostabi, Raymond Pettbon. John M. Bennett, S.A. Griffin, Claude Pelieu, Mary Beach, Jean-Jacques Lebel, Joel Hubaut, Philip Meersman, Luc Fierens, Renaat Ramon, Patrice Lerochereuil and many more. Copies will be available for purchase at the event.